Azadeh, P., Yaghobi Joybari, A., Sarbaz, S., Ghiasi, H., Farasatinasab, M. (2016). Solitary Psoas Muscle Metastasis of Gastroesphageal Junction Adenocarcinoma. Iranian Journal of Pathology, 11(1), 76-79. Payam Azadeh; Ali Yaghobi Joybari; Samaneh Sarbaz; Hosein Ali Ghiasi; Maryam Farasatinasab. "Solitary Psoas Muscle Metastasis of Gastroesphageal Junction Adenocarcinoma". 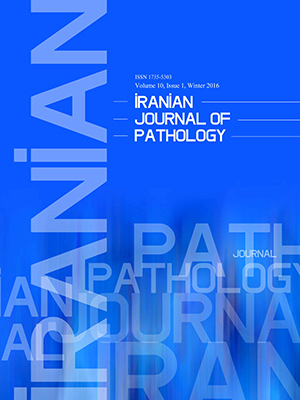 Iranian Journal of Pathology, 11, 1, 2016, 76-79. Azadeh, P., Yaghobi Joybari, A., Sarbaz, S., Ghiasi, H., Farasatinasab, M. (2016). 'Solitary Psoas Muscle Metastasis of Gastroesphageal Junction Adenocarcinoma', Iranian Journal of Pathology, 11(1), pp. 76-79. Azadeh, P., Yaghobi Joybari, A., Sarbaz, S., Ghiasi, H., Farasatinasab, M. Solitary Psoas Muscle Metastasis of Gastroesphageal Junction Adenocarcinoma. Iranian Journal of Pathology, 2016; 11(1): 76-79. Metastasis of gastroesphageal junction (GEJ) adenocarcinoma in skeletal muscle is rare and primary sites for skeletal muscle metastases are usually lung, renal and colorectal cancer. We have encountered with the first case report of solitary psoas muscle metastasis of GEJ adenocarcinoma. Here we describe a 65 years old man was diagnosed with GEJ adenocarcinoma in tertiary hospital, Tehran, Iran in February 2014. We were not able to use PET techniques due to lack of access. Staging CT scans demonstrated a small mass lateral to right psoas muscle. A CT-guided core needle biopsy of right psoas muscle was performed that supported a diagnosis of adenocarcinoma consistent with primary adenocarcinoma of the GEJ. Distant metastasis to skeletal muscle rarely occurs in patients with GEJ adenocarcinoma, but heightened awareness to these soft tissue lesions is warranted. CT or MR imaging could show findings suggestive of metastatic disease, although PET is preferable modality. Azadeh P, Yaghobi Joybari A, Sarbaz S, Ghiasi HA, Farasatinasab M. Solitary Psoas Muscle Metastasis of Gastroesphageal Junction Adenocarcinoma. Iran J Pathol. 2016: 11(1): 76-79. Surov A, Hainz M, Holzhausen HJ, Arnold D, Katzer M, Schmidt J, et al. Skeletal muscle metastases: primary tumors, prevalence, and radiological features. Eur Radiol 2010; 20(3):649-58. Hasegawa S, Sakurai Y, Imazu H, Matsubara T, Ochiai M, Funabiki T, et al. Metastasis to the forearm skeletal muscle from an adenocarcinoma of the colon: report of a case. Surg Today 2000; 30(12):1118-23. Nabeyama R, Tanaka K, Matsuda S, Iwamoto Y. Multiple intramuscular metastases 15 years after radical nephrectomy in a patient with stage IV renal cell carcinoma. J Orthop Sci 2001; 6(2):189-92. Molina-Garrido MJ, Guillén-Ponce C. Muscle metastasis of carcinoma. Clin Transl Oncol 2011; 13(2):98-101. Rehman SU, Cope DW, Basile JN. Metastatic gastroesophageal adenocarcinoma to skeletal muscle: a unique event. South Med J 2002; 95(9):1076-8. Heyer CM, Rduch GJ, Zgoura P, Stachetzki U, Voigt E, Nicolas V. Metastasis to skeletal muscle from esophageal adenocarcinoma. Scand J Gastroenterol 2005; 40(8):1000-4. Wu G1, Bybel B, Brunken R, Lin H, Neumann D. PET detection of solitary distant skeletal muscle metastasis of esophageal adenocarcinoma. Clin Nucl Med 2005; 30(5):335-7. Kozyreva ON, Mezentsev DA, King DR, Gomez-Fernandez CR, Ardalan B, Livingstone AS. Asymptomatic muscle metastases from esophageal adenocarcinoma. J Clin Oncol 2007 20; 25(24):3780-3. Cincibuch J, Mysliveček M, Melichar B, Neoral Č, Metelková I, Zezulová M, et al. Metastases of esophageal carcinoma to skeletal muscle: Single center experience. World J Gastroenterol 2012 Sep 21; 18(35): 4962-4966. Sudo A, Ogihara Y, Shiokawa Y, Fujinami S, Sekiguchi S. Intramuscular metastasis of carcinoma. Clin Orthop Relat Res 1993; (296):213-7. Weiss L. Biomechanical destruction of cancer cells in skeletal muscle: a rate-regulator for hematogenous metastasis. Clin Exp Metastasis 198; 7(5):483-91. O'Keeffe D, Gholkar A. Metastatic adenocarcinoma of the paraspinal muscles. Br J Radiol 1988; 61(729):849-51. Sridhar KS, Rao RK, Kunhardt B. Skeletal muscle metastases from lung cancer. Cancer 1987 15; 59(8):1530-4. Flamen P1, Lerut A, Van Cutsem E, De Wever W, Peeters M, Stroobants S, et al. Utility of positron emission tomography for the staging of patients with potentially operable esophageal carcinoma. J Clin Oncol 2000 15; 18(18):3202-10. Meltzer CC1, Luketich JD, Friedman D, Charron M, Strollo D, Meehan M, et al. Whole-body FDG positron emission tomographic imaging for staging esophageal cancer comparison with computed tomography. Clin Nucl Med 2000; 25(11):882-7.